Leonidas Asteris, the Archon Protopsaltes of the Holy Great Church of Christ, was born in the Commutity of Galata Constaninople in 1936, and started his musical career as a Canonarches in the Holy Church of St Nicholas. He studied by the ever-memorable Panagiotes Constantinides, Archcantor of the Archiocese of Constantinople, who was know for his melodic voice and his love for the tradition. At the age of ten and thirteen he was twice called by the Archon Lambadarios T. Stanitsas and the Archon Protopsaltes C. Priggos into the Patriarchal Church. After this, he chanted as a Domestikos next to his first teacher in the Holy Church of Christ th Saviour at Galata. From 1958 until 1963, he served as an Archcantor in the Holy Church of Ss Theodores at Vlaga, where priest in charge was Fr John Galanes, who was a student of Iakovos Nafpliotes the Archcantor. From 1963 until 1979, he was Archcantor of the Holy Metropolis of the Prices' Islands, having as second cantor the sweet-voiced, theoretician and tachygrapher Stephanos Brousalis. Here the divine providence brings him together with Anastasios Michaelides, the last Great Domestikos, from whom he learned everything that he had to know when he would later take up the heavy yoke of the Protopsaltes of the Great Church of Christ. 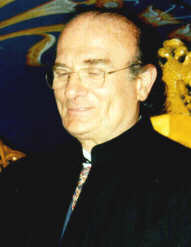 From 1979 until 1984, he chanted in the Holy Church of St Demetrios at Tatavla as an Archcantor of the Holy Archdiocese. In 184, he was called by the Ecumenical Patriarch Demetrios to fill the position of the Archcantor of the Great Church of Christ, a position which he holds until today. Leonidas Asteris is a graduate of the Odeion of the Lyric Scene and Art and a protagonist of the Lyric of Constantinople from 1969 until today, and has performed many works of the german and italian repertoirs. He studied at the Mozart School at Salzburg under great teachers (Srairer, Diskau). He was honoured in a competition with the Karl Orf prize because of his performance in the Church of Saint Vlasios (Saint Blasius Kirche). He also teaches at the Department of Music Science and Art of the University of Macedonia, orthophony and technical calophony, subjects which are vitally important for cantors.